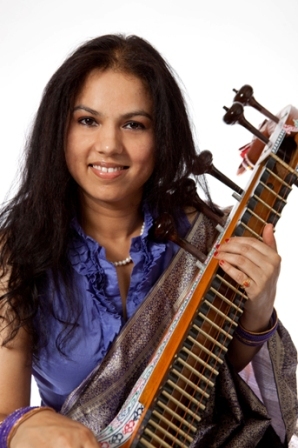 Music lessons in Schaumburg, IL are conducted by "Veena Pani" Saraswathi Ranganathan. The curriculumn includes Junior, Senior and Vidwat (proficiency) level Veena and Vocal music lessons. Saraswathi offers training specially tailored for children who are enthusiastic in learning and also for refined performers. Her students have performed at many cultural celebrations across Chicago. Saraswathi Ranganathan (Sara) brings a fresh verve to Veena rendition with her smooth play, winning praise from critics and connoisseurs alike. Whether it is classical carnatic or fusion music, Saraswathi handles the instrument with ease and aplomb. She has been aptly conferred the name ‘Veena Paani Saraswathi’. The granddaughter of Spashta Gana Kalamani, Gana Sudhakara Late Smt. Sulochana Mahadevan, she had her initial training from her mother Shantha Ranganathan, and advanced guidance from Karnataka Kalashree E P Alamelu. Smt. Shantha Ranganathan is an AIR artiste from Bangalore with expertise in Carnatic classical music, Thiruppavai, Thiruvempavai, Raga composition, Bhajans, Sanskrit Stotras and Devaranama. She believes in equal opportunity for everyone to learn music. She peformed Devaranama regularly on AIR Mysore and Bangalore. Smt.Shantha is also well versed in Bharatanatyam. She received intensive training from her mother Spashta Gana Kala Mani,Smt. Sulochana Mahadevan. and performed with her Mother all over India. 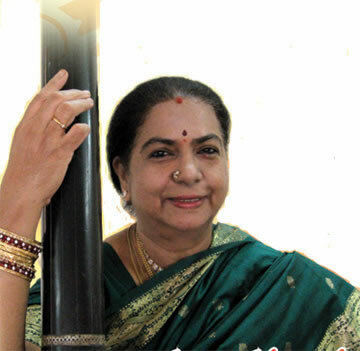 Her recordings of Andal thiruppavai and Vaaranamaayiram are very popular among rasikas.. She is training kids and adults alike, in Irving, TX coaching them for both beginner and senior level Carnatic Music. Ganapathi (Gana) Ranganathan is a talented, accomplished and dedicated artiste performing Mridangam for many years now. Ganapathi has a natural feel and knack for rhythm that makes him versatile - he handles many percussion instruments like Tabla and Kanjira with ease. Gana received tranining in percussion from Gurus like T N Shashikumar, Vasudeva Rao and T A S Mani from Bangalore, India. He is presently consulting with Vidwan Patri Sathish Kumar. Gana has won several awards and distinctions and has performed at prestigious venues in India and US. Gana plans to continue expanding his repertoire through cultural exchanges and performances. He performs for all the community musical events and Arangetrams. Gana is training kids and adults alike in basic and advanced percussions - Mridangam, Tabla and Khanjira lessons in Irving, TX, in his unique style. Carlo Basile has a Master's Degree in Classical Guitar performance and pedagogy from Northeastern Illinois University. His Master's Degree performance was titled "Flamenco Music and Spain's Nationalist Composers." Carlo studied Classical guitar with Anne Waller at Northwestern University for 7 years. He continues to study flamenco guitar in Cordoba and Sevilla Spain with various teachers including Luis Ruiz ("Calderito"). Internationally, Carlo has travelled to and either performed, lectured, or collaborated with musicians from Rajasthan, India; Mirissa, Sri Lanka; Chang Mai, Thailand; Cebu, Philippines; Merzouga, Morocco; Camaguey and Havana, Cuba; Limassol, Cyprus; Zabalo, Ecuador and Paracho, Mexico. Local performance credits include: Evanston Ethnic Arts Festival, Chicago Cultural Center, The Harold Washington Library, The Hothouse, Elmhurst Art Museum, plus many middle school, high school and university programs with Las Guitarras. Carlo also plays guitar for the Music for Medicine Program at Edward Hospital in Naperville, Il. As solo guitarist, Carlo has performed for hundreds of corporate and private events over the past 10 years. Carlo is the founder of Las Guitarras de Espana. He performs, composes, and produces music for the ensemble. 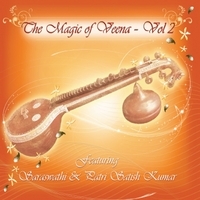 Gharana. He is both an accomplished soloist and accompanist. He has obtained Master’s Degree (Sangeet Analkar) in Music. He has participated in several music concerts in India, France and USA and accompanied renowned artists. Apart from being a musician, Dhananjay has a Ph.D. in Microbiology. 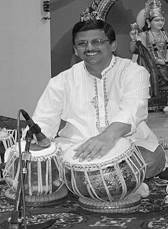 He is actively involved in teaching the art of tabla to students in the Chicagoland area. Dhananjay has been teaching tabla for the past 28 years. He offers weekly Tabla classes either in group or individual basis. Vijayalakshmi (Viji) Ranganathan, Bharatanatyam and Carnatic music artiste is a singer, music producer, creative choreographer. She trained under her Mom Smt.Shantha Ranganathan in Melattur style and in Vazhuvoor style Bharatanrityam from Smt. Sangeetha Sridhar. Her tutelage in music under Smt.E.P.Alamelu and from her Grandmother, has inspired her to take a soulful approach to singing.